What Constitutes a Bird Form? 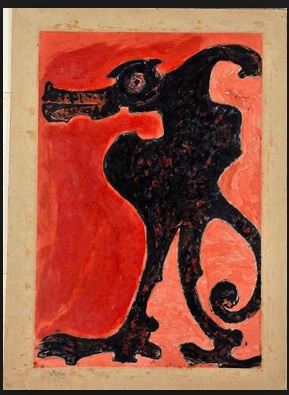 As I’ve stated in my previous blogpost, Tagore’s birds tend to be fantastical rather than real; sometimes they are even chimeric (chimera: a composite of the physical attributes of two or more kinds of animals, mythical beasts, and often humans). So what constitutes the bird form? The simple answer seems to be its constituent parts: its beak, its eyes, a head, a body, feet and a tail and additionally, what it is covered with, i.e. rather than skin or fur, birds are normally covered with feathers. Obviously, some of these parts are shared by other creatures, including humans. That is, we also have eyes, a head and feet making up our body. And of course, while we may not have tails, animals do. But neither humans nor animals have feathers, which only birds have and yet neither Tagore’s nor my paintings include anything resembling feathers. Perhaps this is because feathers lend detail, thus distracting attention from the elemental form of a bird. Put another way, feathers lend unwelcome realism to a language that leans towards abstraction. 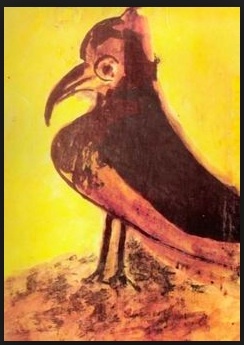 What is striking about several of Tagore’s birds is the fact that he often suggests the form of a bird with a few spare lines, using, for example, a beak or wings — obvious, characteristic identifying features of avian creatures. These identifying characteristics assume greater importance precisely because Tagore — for the most part anyway — does not paint real birds. In other words, these touches of figurativeness can lend definition even to the most abstract form. However, unlike feathers, a beak or wings remain more adaptable to abstraction. 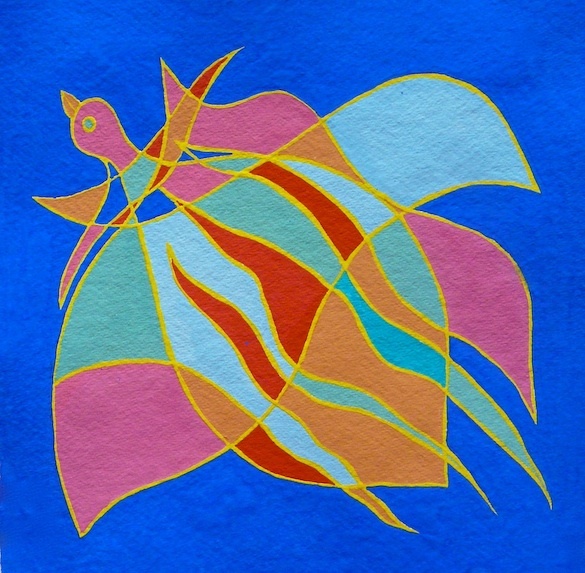 I mentioned in my initial blog post that my bird paintings are influenced by Southern Indian women’s geometric floor-drawings, which often have a grid of dots or other markers, with innumerable combinations and permutations of lines connecting the dots either by being looped around them or by going over them. Sometimes, I similarly use a bird ‘template’, for want of a better term, but I find myself experimenting with the manner in which the lines might operate within this template. 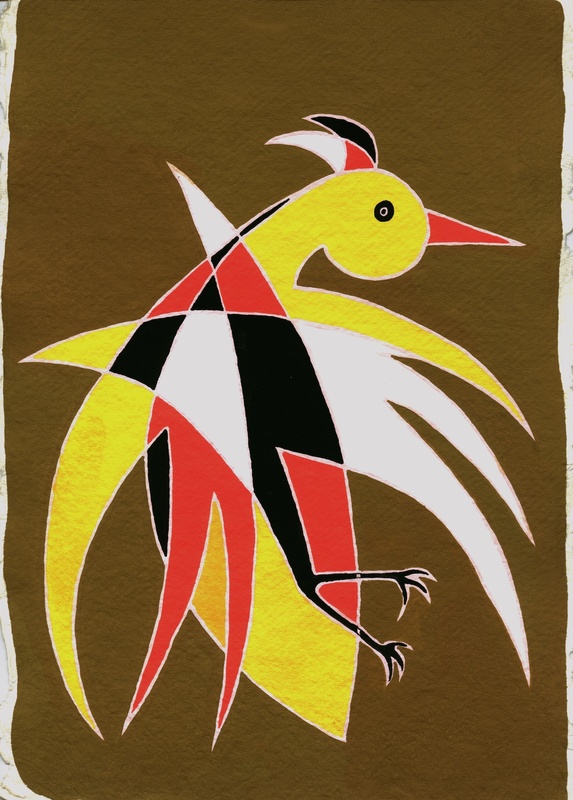 The geometric shapes then become increasingly abstract, but like Tagore, I use the beak and the wings as distinguishing characteristics, to evoke the form of a bird. You might therefore say that the identifying characteristics constitute the broad template I envision at the outset. Most often, I also add bird-like feet and an eye or two, strategically placed to intimate the avian form. Like the prana-pratishtha in an Indian temple, where the placement of eyes on an idol is believed to breathe life into it, I add the eye(s) to give the form life. Sometimes the bird is only hinted at; at other times, it is suggested more overtly. Like Tagore’s birds, mine are sometimes geometric, sometimes quite amorphous, but the beak especially, lends figuration, thus transforming both geometry and amorphousness into something that might remind us of birds. This is one reason why I find the bird form fascinating: it lends itself equally well to abstraction, to realism and to the decorative. Its adaptability therefore, is useful to those who wish to maintain plasticity in form. 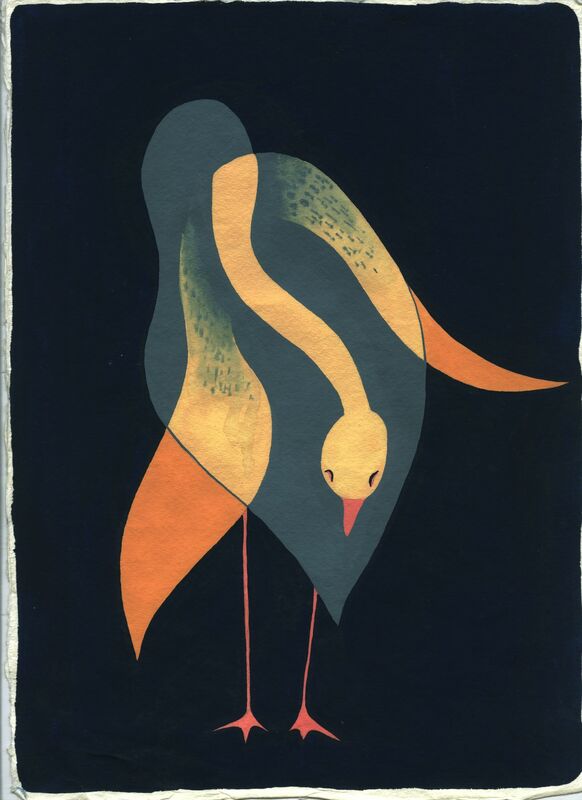 Here then, are a few examples of how a geometric, abstract or amorphous form might be transformed into the intimation of a bird, through the introduction of a beak, wings or even feet. One might say that such additions point to a token interest in birds, added as if the bird form were an afterthought, but in fact, I always begin a bird drawing by thinking of the distinguishing characteristics of birds and what birds represent to me, i.e. freedom. In some way therefore, it is not sufficient to suggest form. 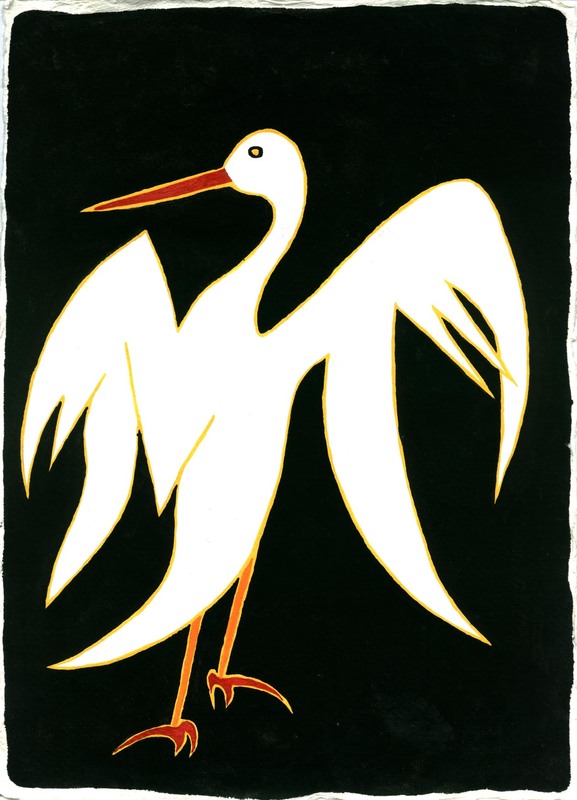 I try to infuse spirit too; the grace and beauty of a bird comes equally from its form and its evocation of freedom. 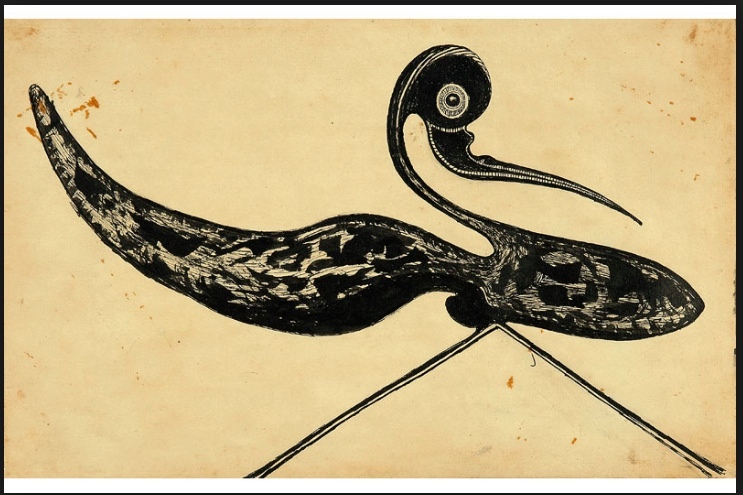 Moreover, the compulsion to continue referring to the bird form despite increasing abstraction and/or amorphousness might even point to a committed engagement to exploring its form and its symbolism. In the two paintings of mine (Aurogeeta, Figs. 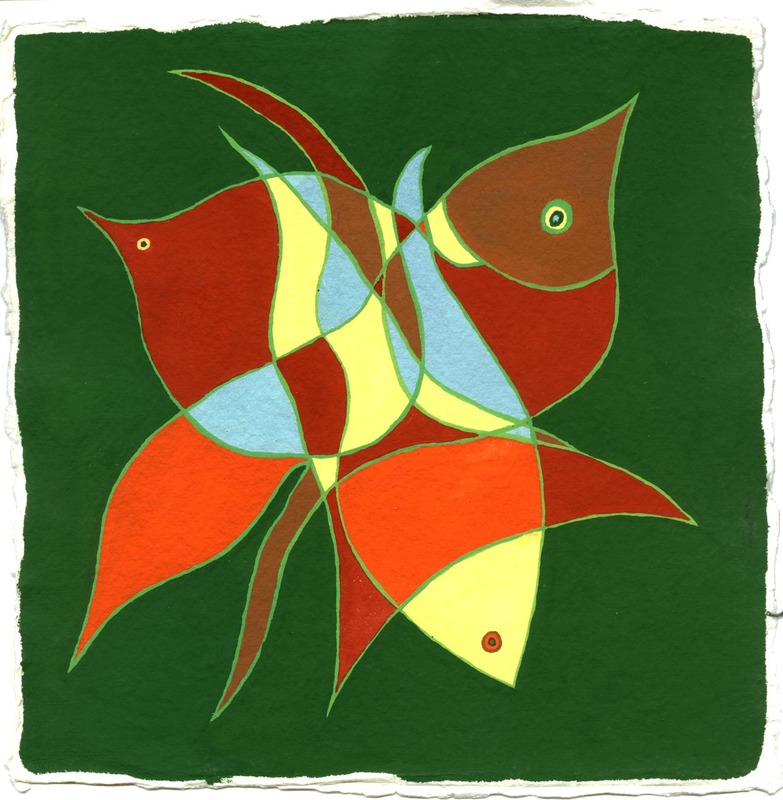 4&5) that resemble fish rather than birds, it is the sinuousness of water that blends into the fish form. 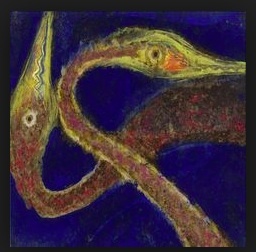 In Tagore’s paintings of what appear to be heads of two swans (Tagore, Fig.4), without the beak, they could just as well have been eels or serpents. While three of Tagore’s paintings reproduced here (Tagore, Figs. 1, 2 & 3) have more clearly distinguishing characteristics of birds, one (Tagore, Fig. 5) appears to have anthropomorphic legs and yet a head with crocodile-like jaws. 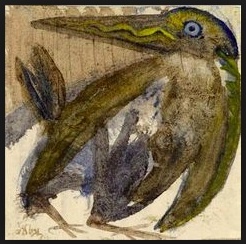 As much as I appreciate Tagore’s bird paintings, his chimeric forms fascinate me even more. Was his interest in chimeric forms merely formal or did it indicate a worldview? This is what I hope to explore next. Fascinating. Your painting style is simple yet evocative. Good to see real expertise on display. Your cotnuibrtion is most welcome.